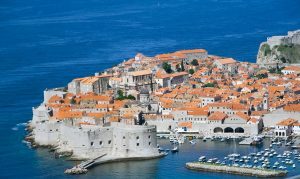 Cruise Croatia on this terrific one week yacht charter itinerary from Split to Dubrovnik, through the islands of southern Dalmatia, including Trogir, Hvar Island, Korcula Island, Vis Island, and Mljet. Enjoy beautiful pristene clear blue-green water, lovely scenery, as prized by the Greeks and Romans, history, and farm to table cuisine. Day 1: Begin your crewed yacht charter by Arriving at the Split Airport to be met by your transfer and head to Split to visit Diocletian’s Palace for an hour or two. 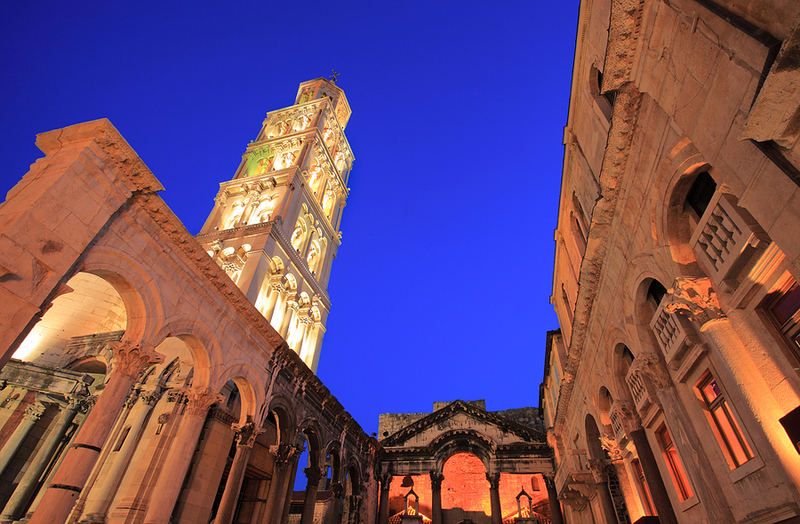 Built at the turn of the 4th century AD, approximately 1600 years ago, by the Emperor Diocletian as a retirement palace, the location is now a UNESCO World Heritage Site. Diocletian designed this palace to be located along the crystal clear waters of what is now the Croatian coastline as a lovely seaside home far from civilization. 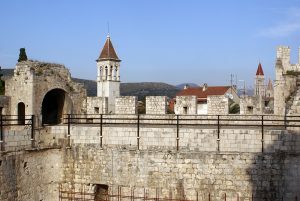 The town of Split grew up within and around the palace walls, as this was a structure built originally for 9000 inhabitants. Over the centuries, locals continued to create their homes within the palace walls and now today there are still homes and shops that are anchored into the structure and there to stay. Now, the Palace of Diocletian is in the literal center of the town of Split, with one side along the sea. The other three sides remaining were built as heavily fortressed walls. The ruins are one of the most complete remains of a Roman Palace in existence. The Palace was built with several different levels, including a subterranean level with fully vaulted ceilings. The seaside façade, which was the main residence of the Emperor, retains the feeling of a villa, while the rest suggests a military camp. After the Romans abandoned the structure the locals remaining moved into the fortified walls for protection, thus establishing the long history retained today of a living ruin, still alive with homes shops, bustling with day to day life. During the many years after the Romans abandoned the palace and today, Christianity made its mark with a church built in the interior of the palace ruins, along with a bell tower, crypt, and a side chapel built into the ruins of a temple. You can wander the area after purchasing entrance tickets on a self-guided tour, or a guide can be arranged. Return to the yacht to board and cruise to Trogir, to overnight on anchor or along the quay of Old Town. 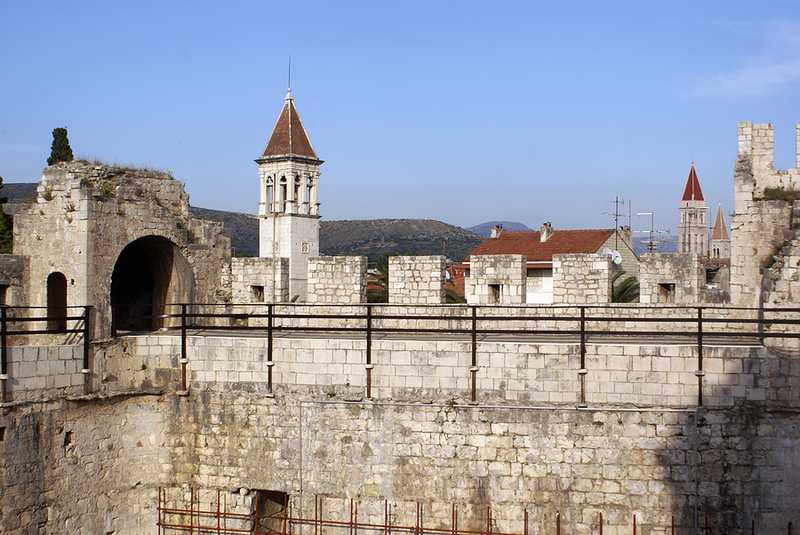 Also a UNESCO World Heritage Site, the Old Town of Trogir is actually located on a small island, connected to the mainland via a bridge with a protected harbor. First established by the Greeks in the 3rd century BC, Trogir has had continuous urban settlement for the last 2300 years. Trogir is considered one of the best examples of a Romanesque-Gothic Medieval walled city still in existence in Central Europe. 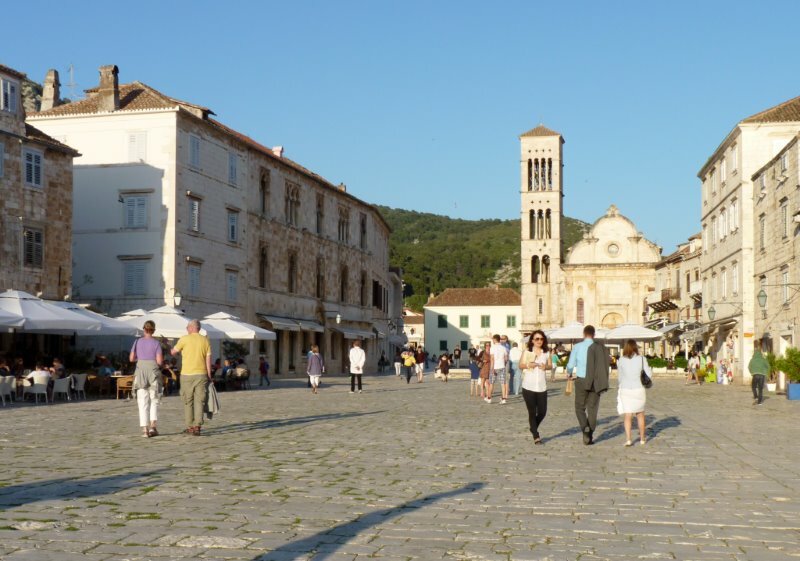 Before dinner on board, take a stroll through Trogir along streets originally laid out in the Hellenistic time period. After dinner are several ice cream shops on the quay and other cafes to enjoy, or sit on the aft deck of your yacht to watch the world go by. Nearby the Cathedral of St. Lawrence you may be treated to a group of Klapa Singers that gather quite often in this location to sing Croatian folksongs. 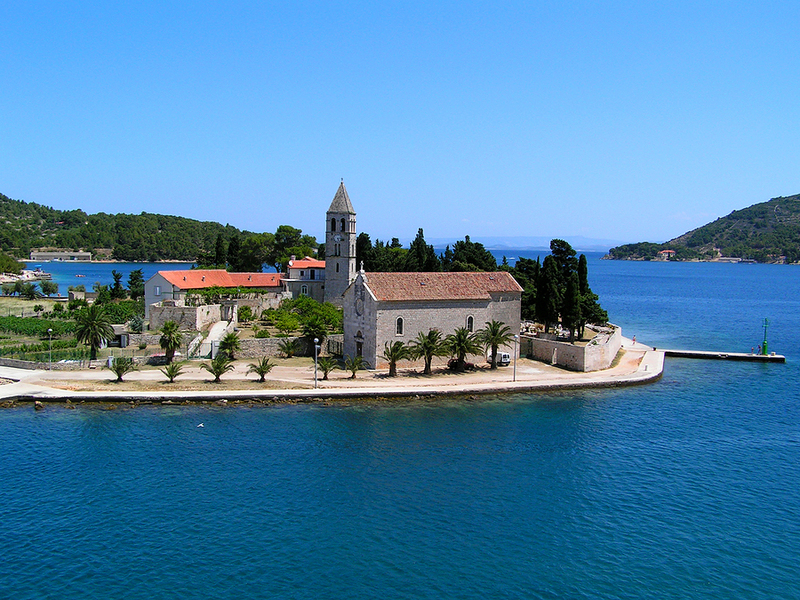 After touring Trogir, leave for the island of Hvar. Sitting in a strategic trading location, Hvar has been a natural stop for seafarers throughout seafaring history, with each civilization leaving a mark on the face of this island reflected in many of the historic buildings and ruins still remaining. Cruise into Hvar Town on the island of Hvar, once home to a major naval base belonging to the Venetian Empire. Dominating the skyline and overlooking the town are remains of an extensive castle. A tour guide can be arranged for several hours for a tour of Hvar Town, or you can wander through town on your own, hiking up to the castle for a great view of the surrounding area. The island of Hvar has long been settled and is very fertile with fields of lavender and grapes, along with fruit and nut orchards. Lavender tussie mussies are readily available at little stands for purchase, and lavender honey is a great treat from this island to try on top of a local cheese. Hvar is known for wine production, producing several labels of distinction. Hvar is also known as the cosmopolitan spot of Croatia, where the European jet setters congregate for nightlife especially at Hula Hula, Carpe Diem and Carpe Diem Beach. 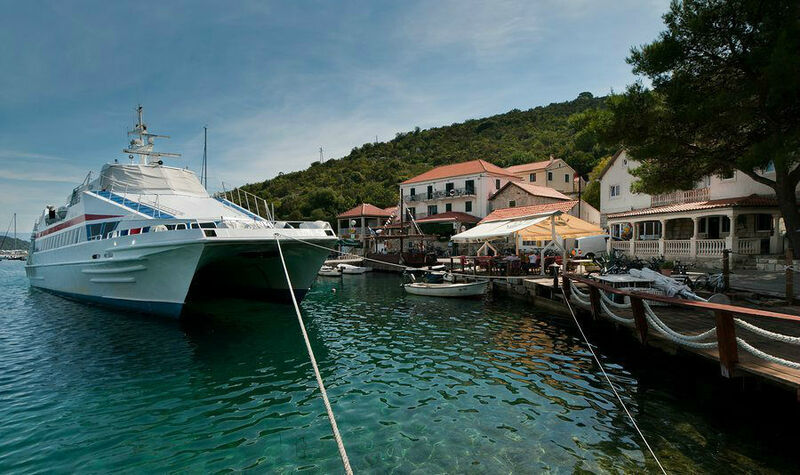 Hvar center is marked by upscale shops, however if a quiet night is of interest, visit Hvar town during the day and head out to a quiet anchorage around the island for a lovely dinner on board under the stars. Day 3: Cruise southwest to the island of Vis, an island many think is one of the nicest undiscovered islands in Croatia. Vis is also home to the Croatian lobster, which looks very much like a New England lobster. Studded with little coves and inlets, one is simply spoilt for choice as to where to stop for a swim. Overnight in Komiza, where Tito hid from the Germans during WW2 and where there are two excellent restaurants serving fresh fish and local produce. One restaurant, Konoba Jastozena is located within a traditional lobster fishery, and is literally a dinghy drive-in for water access. Overnight in Komiza. Day 4: The island of Vis is large and well worth spending 2 days in various parts of the island. In the Gradina area are remnants of the ancient Greek town of Ussa. On the small Pirovo promontory are remains of a Roman theatre and thermal baths. Be sure to head off in the morning for a short sail to the off-lying island of Bisevo, where a quick jump in the dinghy will reveal the “Blue Grotto”, an underwater cave that during the morning is lit from the sun, giving the water an amazing color. Head back to Vis town, a charming old town with some excellent restaurants and a wine bar where they serve nothing but wine from Vis. Or find a lovely anchorage in one of the many coves to overnight. Day 5: Cruise to Vela Luka on the island of Korcula to anchor for a hike inland to the Gulin Farm for a “Homestead” meal at the farm. This is an event that your Captain must reserve in advance. 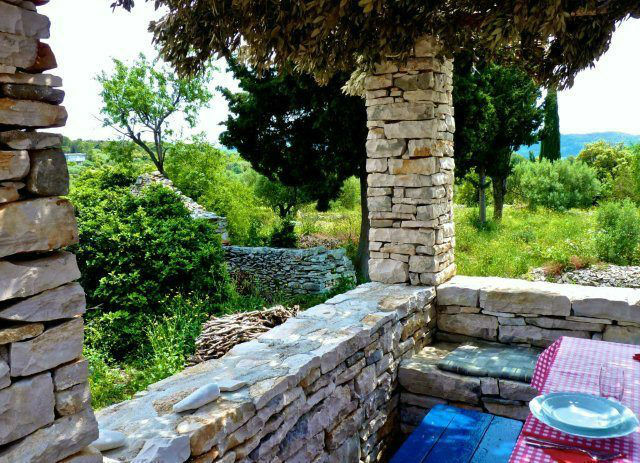 Unique to Croatia, local family farms open for hospitality and home cooked traditional Croatian food of fresh wood grilled fish, home grown vegetables and meats cooked with herbs under the traditional Peka lid covered with cinders and sealed with hard wood ash. This is a taste of local real Croatia including fresh baked bread, farm pressed olive oil and farm wines. After lunch cruise to Korcula Old Town to explore this traditional medieval walled city, which is one of the largest medieval walled cities still in existence today. 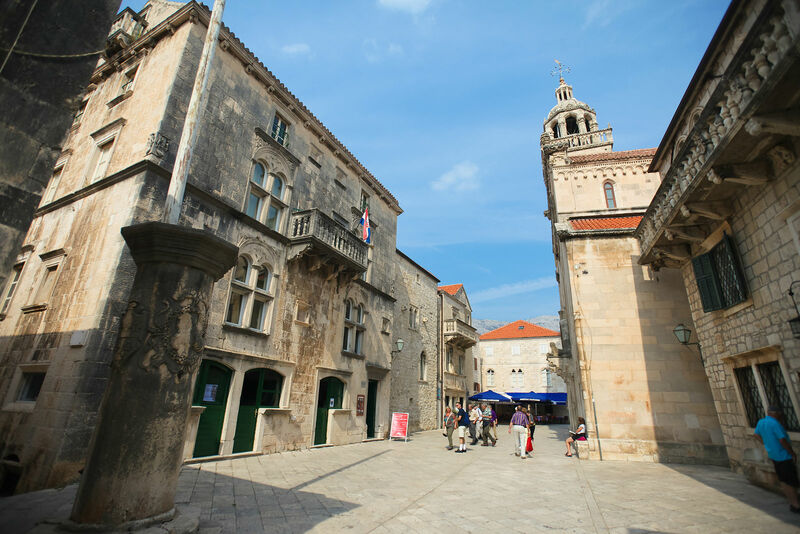 The whole of Korcula Old Town is surrounded by 14th century medieval thick stone walls including towers that were used for defense of the town during past centuries. The inside of the walled area, which was built on an oval shaped raised area of ground was built with a main road along the highest area of the ground with small roads off on either side, so that the interior area outlay of roads is often referred to as a fish skeleton. This layout of the town in a somewhat herringbone pattern allowed free air circulation but protected all inside from the strong local winds. The interior streets are all walking streets and are all stepped, which further retains the Old Town for pedestrian traffic only. Inside the Old Town are shops, restaurants, cafes and a museum in the house considered to be the birthplace of Marco Polo. Indeed, both Marco and Polo are common first and surnames in this area. Be sure to walk inside the Old Town as well as around the outside to see the old fortifications and towers, perhaps stopping in the little café in one of the towers where drinks are hauled up to the top by rope. Just off of the coast of the island of Korcula, part of the Korcula Archipelago and the resort island for the inhabitants of Korcula, is the island of Vrnik, which offers great secluded swimming locations with beautiful clear blue water, and on land, there are many deep stone quarries dating back to Roman times. Overnight in a lovely anchorage on Vrnik. 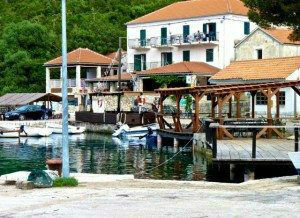 Day 6: Cruise along the Peninsula Peljesa to the very green island of Mljet, 95% of which is a National Park. Cruise up a long fjord on the island to the little town of Polace, so called for the ruins of a Roman palace (polace) which cut right through town. This is a lovely anchorage, with a little town rimmed with fish tavernas, and is a favorite of yachtsmen. Ashore Restaurant Ankora creates a black squid ink risotto, which is virtually a Croatian national dish that is felt to be one of the best versions of this dish in Croatia. Because the waters surrounding Mljet are mainly a national park, the waters are full of fish, shellfish, and squid which are daily fished by locals for great seafood meals. Take a look at the back docks of the various shore side tavernas, each of which have a small cage suspended under the dock harboring lobster, fish and mussels to be plucked right out of the water and into the pan for dinner. Have the Captain call to be sure that Restaurant Ankora is making their famous risotto and head ashore for a great dinner. Overnight. Day 7: The area surrounding Polace is filled with hiking and bicycle trails. Bicycles are available for rent as well in Polace. 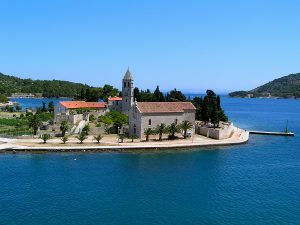 So enjoy cycling or head out hiking on one of the trails or National Park roads, for located within Mljet National Park are two lakes, Veliko and Malo Jezero (Large and Small Lake) with buildings from the old Benedictine Monastery on Islet Melita in the middle. These lakes once were fresh water and are now salt water. It was the Benedictine Monks that changed the very nature of the lake waters that surrounded them, by building a canal from the lakes out into the sea. This changed the lake fresh water to salt water forever. Today the monastery building is a café restaurant, and you can explore the various buildings and hike around the little island. The island can be accessed either by National Park boats after hiking or riding to the little quay over the hill from Polace, or by moving the yacht around to the opening of the lakes to explore the lakes in the ships tender, and enjoy water toys such as sea kayaks. In the afternoon head to Dubrovnik and anchor nearby. Take the ship’s tender into Dubrovnik to wander the old walled city, before returning for a last dinner on board on the aft deck. 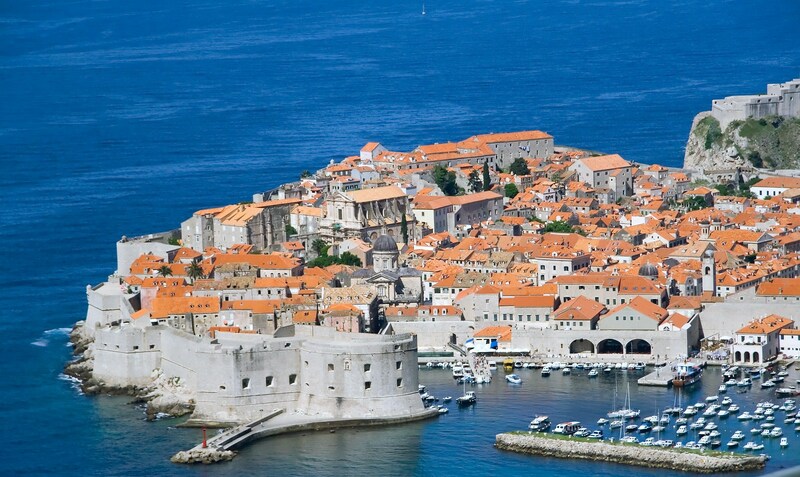 Dubrovnik, the “jewel of the Adriatic”, was an independent, merchant republic for some 700 years and has enchanted the wealthy, the powerful, the artist, and of course, the sailor, throughout it’s remarkable history. The old town, completed in the 13th century, remains virtually unchanged. Tall ramparts surround it and there are only two entrances to the old town which lead to the Stradun, the city’s promenade. In 1991, the Serbs shelled the city causing considerable damage, but thanks to local efforts and international aid, the old town has been restored to its former beauty. Enter the old town through the Pile Gate and in front of you is the Stradun. Here you will find the Onofrio Fountain, built in 1438. On the right is the Franciscan Monastery, with one of the oldest functioning pharmacies in Europe, in operation since 1391. At the other end of the Stradun, you will find the locals’ favorite meeting place, the Orlando Column, with the nearby Sponza Place and the baroque church of St. Blaise. 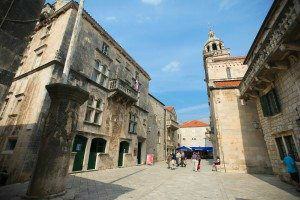 Here is also the Rector’s Palace, built in 1441, which is now a city museum packed with valuable and historic exhibits. Opposite the palace through a narrow street is a square, Gunduliceva Poljana, which is the site of the busy morning market. In the same square is the Jesuit Monastery from the early 18th century. From here you can head for the little old town port and visit the city walls, built between the 13th and the 16th centuries, which encircle the city and which have been remarkably preserved. Day 8: Disembark in the am in Dubrovnik.